A Online History Book Group? 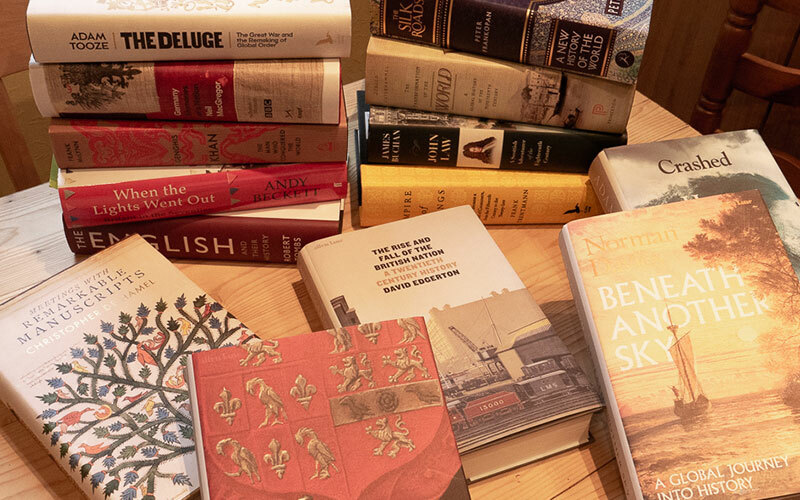 If you’re a reader of history books, you’ll know that often they can be both long and dense, and it can take time to work through them (or am I alone? My current to-be-read pile is shown in the photo above…). So they’re not ideal for the average reading group. And as well, are there enough people in your own U3A who are interested and willing to read large tomes? To a tight timetable? So I thought it might be an idea to see if we could create an online version of a reading group to read heavyweight history books. Elsewhere, we’ve recently been experimenting with a very simple and easy to use video-conferencing system called Zoom, and the transatlantic Economist Reading Group has just been formed, linking UK U3As, US and Canadian ones. The approach has worked quite well, and in an earlier trial, we had over twenty people on-screen and contributing. An online History Book Group would choose a book, and perhaps take three or four months (or even longer) to work through the book together, with members taking it in turns to lead a discussion in a video-chat. The Group could meet monthly or more frequently, or a couple of chapters a fortnight, perhaps. Whenever I’ve read books in this fashion, there are nearly always diversions you want to make and follow-up on other connected topics. The online group could do this, too. I know the approach works because in my own U3A, our World History Group can take many months to work through a topic: the East India Company took the best part of a year, and even a ten-year period, currently 1700-1710, can take six months. Your pile will certainly be different, but I’m sure we’d find some common ground to start things off. If you are a U3A member from anywhere in the world and would like to take part in this experiment, please drop an email to jpkaye+u3ahist@gmail.com and we’ll take it from there.